This is an online 3d harmonograph version of those harmonograph devices often seen in science museums – except that instead of drawing pretty harmonic patterns on paper, here we plot them in 3D-space! Glowscript code and my other efforts are available at Mandrian‘s GlowScript Programs. Vpython code is available at Github. MIT License. My original Vpython code and further information available here. Click on Run! to draw the next harmonograph. I posted this on GitHub some time ago, and forgot to post about it here. So here it is now. The idea is simple enough: harmonographs are just graphical representations of the sums of the motions of 2 or more pendulums on the 2D plane, such as a piece of paper, just as you see on those devices in all good science museums. We can program this by treating their motions as harmonic – i.e. sine waves, with damping due to friction. However, there’s no reason not to extend the pendulums’ motions to 3D. 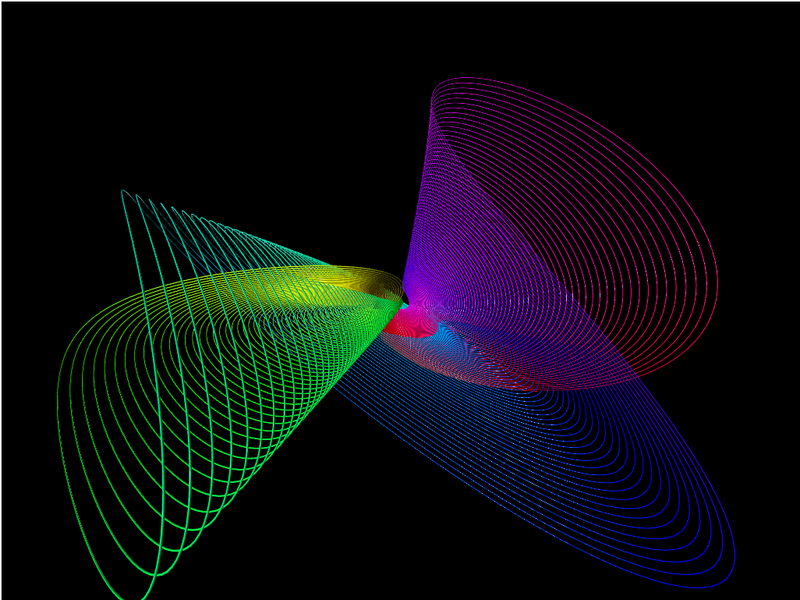 My previous harmonograph used PyGame for the graphics, but AFAIK there’s no builtin 3D. So for this exercise I switched to Vpython. VPython is the Python programming language plus a 3D graphics module called “visual” originated by David Scherer in 2000. This was fairly straightforward but for one oddity: as the trace grew, it started to become ‘angular’ or jagged at the outer boundary. The ugliness was a deal-breaker. After a lot of Googling I discovered from the documentation that ‘trail’ would only hold up to 1000 points, after which it silently dropped points regularly along its length (in order to keep the drawing process smooth). So then I tried just starting a new trail after 1000 points, following on from the current trail. It worked! Uses Vpython. Hold down right mouse button and move mouse or trackball to rotate. Press any key for next harmonograph (e.g. space bar). #   My solution is to start a new trail every 1000 points. A simple, so-called “lateral” harmonograph uses two pendulums to control the movement of a pen relative to a drawing surface. One pendulum moves the pen back and forth along one axis and the other pendulum moves the drawing surface back and forth along a perpendicular axis. By varying the frequency and phase of the pendulums relative to one another, different patterns are created. Even a simple harmonograph as described can create ellipses, spirals, figure eights and other Lissajous figures. More complex harmonographs incorporate three or more pendulums or linked pendulums together (for example hanging one pendulum off another), or involve rotary motion in which one or more pendulums is mounted on gimbals to allow movement in any direction.